Whether you are designing for print, packaging or online, almost everyone wants a portfolio site that is easy to manage and maintain while providing a good visual experience. With so many different portfolio tools and services out there, though, how do you choose what works best? Today, we are taking a look at five nice online portfolio tools. We’ll weigh the pros and cons and pricing for each in hopes that it will help you choose the right tool to display your work. Behance might be one of the most well-known portfolio sites out there. And they back it up with some pretty big numbers: 70,000-plus project views each month. The site is part of the Adobe family of products and Creative Cloud subscribers get access to Behance’s Pro site with their subscriptions. The site has expanded from a place to showcase your work to a site packed with sharing tools, inspiration and job listings. Behance is one of the easiest platforms out there to use, making it a great choice for print designers who don’t want to get into web development or coding. The interface is easy to understand and uploading images is a breeze. In addition to hosting your portfolio, the Behance network allows other creatives to “appreciate” your work. (It’s like a virtual high five for a job well done.) You can also follow other designers for an instant pinboard-style homepage. This feature works great if you keep up with a good number of other designers, otherwise it seems to fall a little flat. Ease of use really is the biggest advantage to this platform. You can organize work based on project type and upload working design projects for feedback. Behance has really worked to create a design community conversation of sorts. Plus, Behance allows you to link social media (including a portfolio plugin for LinkedIn) and share your entire portfolio or just pieces of it. You can also customize your Behance URL for a more custom feel. There are not a whole lot of design options with the Behance portfolio, leaving most users with the same overall look and feel for their sites. File size is another limitation. Images have to be compressed and saved for the web before upload, so prepping work for your portfolio can be somewhat time consuming. And while some users may like the feedback you can get on Behance, it can be a little intimidating. Projects show how many people have looked at them and shown appreciation. It can be a little tough to look at if you have a project you were really proud of and no one is viewing it. Creating a Behance portfolio is free, and you can interact with other users. Pro features are included with an Adobe Creative Cloud subscription. 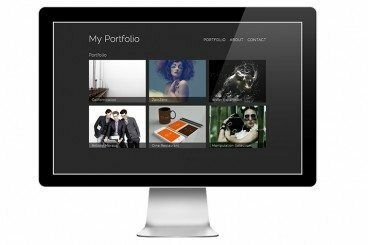 Dunked is a simple solution for building an online portfolio. The site, which is still pretty young, allows designers to showcase print and digital projects. The service has more than 70,000 registered users. Dunked is easy to use – super easy. The interface is intuitive and almost does your thinking for you when it comes to uploading items. The interface includes a ton of customization items and preset templates (which look great and are ready to use). One of the things that’s really great about this tool is that it allows for a lot of different file types. You can add still images as well as video and audio to your portfolio with this tool. You can also include detailed descriptions about your portfolio items, links and use tagging to sort items. Dunked allows users to select a custom URL, includes responsive and retina-ready templates and includes CSS editing for those who want a little more portfolio control. The biggest downside is having a portfolio that looks like someone else’s. The Dunked library includes seven templates – which all look great – but without customization, you site may be confused for that of another designer. You also have to create and “design” thumbnail images for the templates. A tool to crop in the editor for this slot would be a great addition. Most of the templates also feature a thumbnail-style design, limiting you when it comes to a big image on the main portfolio page. Folio 24 uses big images or video to get people to look at your online portfolio. The site has a big feel with plenty of room for display. Folio 24 offers both free and paid accounts for different types of users. One of the big benefits of Folio 24 is that you can get a big, highly visual site with no HTML or CSS knowledge. And the interface is one of the simplest out there. There was really no “figuring out” when it came to getting set up and started with the site. Folio 24 also allows you to link a blog in the navigation menu (a feature that is really nice) and will allow you to link to Facebook and Twitter for easy social sharing. This platform also allows you to create private galleries. This option is a nice feature for working on something without it being live or to share with a particular client. There are not that many customization features. You can change titles, banners and colors. There are only three font choices for your page. The free account is also pretty limiting when it comes to the size of your portfolio with a 35-photo upload maximum. Images must also be less than 4MB. For people with small portfolios this will not be an issue, but for larger portfolios a paid account is a must. In addition to a free plan, Folio 24 offers two levels of paid accounts. For $6 per month, you get 500 uploads (6MB max) and for $9 are allowed 1,500 uploads (8MB max). Paid plans also unlock custom domain name support. At first glance Portfoliobox has one of the most stunning setups of the portfolio sites we talk about here. It uses oversized images to grab users. The display is big and bold and if you have work that will work in this format, or a project you really want to show off, this is the perfect format. Portfoliobox sites are fully responsive and unlike some of the other sites, you don’t have to pick a standardized template or theme. The interface includes a smattering of pieces that you can use interchangeably like blocks. There are no content type restrictions with Portfoliobox and you can include a blog within your portfolio site. Portfoliobox also includes the option to sell images in an e-commerce store right from your site (a fun bonus), CSS editing options and SEO tools. The pro plan is $6.90 per month with an annual subscription or you can try one week for $10. Sliding Boxes features just what you would expect from the name – a portfolio site that is made with sliders and plenty of effects for your work. The interface is designed for artists, photographers and illustrators and you can get a portfolio online quickly with no coding required. Sliding Boxes is fully responsive and looks great on a lot of different device types. The slider effects are pretty snazzy with a handful of options for transitions, including slides, scrolls and fades. The interface here is easy. Really easy. Plus you can connect through social media and customize with a custom logo in the header or menu bar. You can customize the color scheme as well. The template offers incredible display space with a simple background. This tool is design to make your artwork shine in a major way, making this a super tool for illustrators, artists or photographers. Many of the sites using Sliding Boxes look a lot alike. The template is just that. So if you are looking for something with a more custom look and feel, this is not the tool for you. Other than the display of images, Sliding Boxes does not have a lot of other extras. And there is not an option to add custom CSS. Sliding boxes has a super small free plan (five projects and 35 images), a basic plan for $7 per month (10 projects, 100 images and a custom domain) or a $11 per month pro plan (50 projects, 500 images and a custom domain). The great thing about a portfolio-building site is ease of use. Every site listed above is easy to use and you can get your portfolio online in less than two hours. The sites have a professional look and feel and really are a nice way to showcase work. The downside is that you aren’t designing a portfolio, which can be a bonus to show off your web design and development chops. But for non-web designers, these tools are a great option. So which plan is for you? It all depends on what you want to publish in terms of your portfolio. Play with a couple of the services to see which one is the right fit for your work. Even if you jump from a free to unpaid plan, the pricing schemes are quite reasonable and should be able to fit into most designers’ budgets.